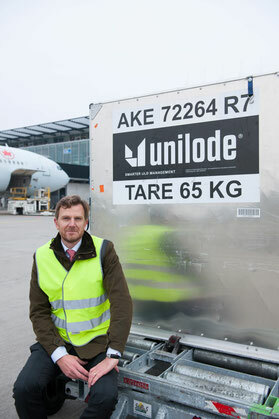 The Zurich-headquartered service provider manages the operation of around 120,000 unit load devices such as containers or pallets on behalf of over 40 mandate airlines. And additional business is waiting just around the corner, states the company’s CEO Benoît Dumont. This, because many airlines will concentrate on their core competencies in the coming years, handing over borderline activities to dedicated specialists like Unilode. The following interview reflects the key points stressed by the executive. CFG: Benoît, do you expect a bigger outsourcing shift of ULDs from airlines in 2018? Benoît Dumont: At present around 25% of the global ULD management market is outsourced, out of which Unilode has an approximate 60% market share, owning the largest outsourced ULD fleet in the industry. In 2017 we have added Saudia Airlines and Saudia Cargo and several regional, low-cost and cargo airlines to our network, such as Surinam Airways, Thai Lion Air, Western Global Airlines and FlyGlobal Charter. We have seen an amazing growth in the outsourced ULD management market over the last few years with currently around 60 airlines running their ULD operations in an outsourced business model. The number of carriers looking at outsourcing continues to grow and this increasing appetite brings plenty of opportunities for service providers to grow their business. We expect the outsourced ULD management market to double within the next five years or so. However, to switch from in-house to outsourced operations is still a long decision-making process for airlines, especially for major carriers, and there is often a resistance to change although the financial and operational benefits are stacking up in practically every case we come across. We have a number of promising prospects in our pipeline and expect to see some major carriers making the move to outsourcing to Unilode this year. CFG: What new technology are you looking at this year? BD: Unilode has entered into an exclusive and strategic partnership with a technology provider and a leading ULD manufacturer and we will launch a digitally enabled pallet into the market, which has a Bluetooth Low Energy (BLE) tag fully embedded into the structure of the unit. We will deploy interoperable Bluetooth readers across our own ULD repair network which at present has 30 repair centres worldwide, and have started to involve players in the market to establish the creation of a Unilode ‘ecosystem’. Our ULD tracking solution will allow the reading of compliant BLE tags supplied by other companies as well therefore Unilode, our customers and partners won’t be dependent on a single proprietary technology. Unilode’s tracking solution will be able to capture information from device-to-device communication as opposed to so-called ‘reader talks first’ technologies. As tracking becomes a challenge when the cargo leaves its expected route and cannot be found near pre-defined reader points this is very important for the successful end-to-end tracking of the shipment. Unilode’s ULD tracking solution complies will all safety regulations of the aviation industry and for our new BLE tag design we have obtained DO160 approval which is required when Lithium Ion batteries are being used. Our tracking solution is safe, fit for purpose and technically sound and will enable end-to-end visibility of our customers’ cargo throughout the supply chain. CFG: Will there be any additions to your services you provide and are new stations standing on your 2018 agenda? BD: In terms of new repair stations we will strengthen our ULD and galley cart repair network with facilities to be opened in São Paulo (GRU), Brazil, and in Jeddah (JED), Saudi Arabia, among others. For the past few months we have been working on exploring the full potential of our company which may also involve the launch of new products and services in addition to our core ULD management and ULD and galley cart repair solutions. With this we intend to offer a more integrated ‘one-stop-shopping’ solution to our customers to ensure that they can focus on their core business. We are pursuing a growth agenda in line with the market demand and will continue to expand our footprint in strategic regions, like Asia and the Middle East. We have much work ahead but look forward to an exciting and successful new year. CFG: Benoit, thank you for your time and the effort. Good luck to you, your team and Unilode in 2018.